We started with new spirit, the ten D.T.W.C. members (less one). How does one distill the illustrious feeling of that first meeting? The date, 16th May 2009. How does one ensure the future maturation of this feeling for the ages? 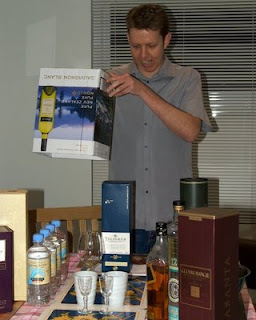 Do you begin with the unashamed unveiling of the Talisker 10yo...from under a wine box? Perhaps it was looking over a detailed map to find a wee Scottish treasure? There it is, the Isle of Skye, scratched across the left-hand side of the page, highlighted pink? 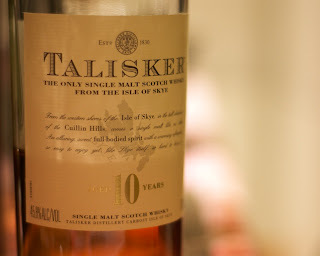 Or was it the first taste of the Talisker 10 yo...a whisky for which my notes read: "pepper, incredibly well-balanced, sea weed, the best example of Skye whisky I can think of?" Maybe it was indulging in refined conversation amongst a heavenly array of quality whisky's, including: the Talisker 10yo, the Glenfiddich 18yo, the Highland Park 16yo, the Glenmorangie 10yo-Original, the Glenlivet 12yo, the Bruichladdich 12yo, the Macallan 1851-Inspiration, the Glenmorangie-LaSanta, the Glenfiddich 12yo and the Johnny Walker Black...huh? 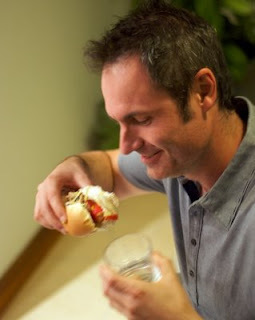 No, it was indulging in the traditional Celtic food of crisps and hot-dogs...with mustard, and cheese, and onion, and mushrooms. Alas, was it the traditional highland music playing on the wireless, Mix 101.1 - The Saturday Night Party Mix? Wait, the new logo! We all proudly wept over the new-born, tears of the collective Thunder clan. Quick, a bottle, these iodine droplets would make a blend for the ages! ...arrgghhh, paash me nother 'fiddich, nah the 'livet then, awewight, maybe the 'laddich as well...noooo, not THAT, who brought the bloody Johnny Walker anyways? They weally don't give a dram! I'm sure the first meeting was many things to all of us, mine but was a wee ode to that. Already looking forward to the second.